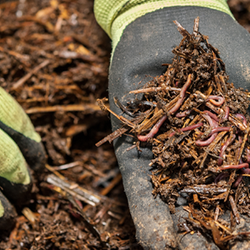 Composting with red wiggler worms is a great way to produce some "black gold." Worm composting is easy, odorless, and a good icebreaker at a party. Tell a group of non-gardeners you’ve got worms and the room should clear out pretty quickly. Tell the same thing to a room full of gardeners, and they’ll wiggle up and want the dirt. Obviously, the gardener group knows you’re talking about red wigglers, the stars of vermicomposting—worm composting. 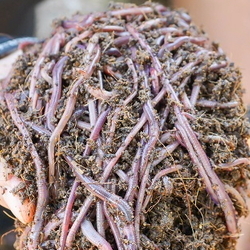 Red wiggler worms, Eisenia fetida, are a species of worm that does well in container composting. They don’t burrow into the soil like earthworms, but they do need to be kept in a sealed container. Native to Europe, these worms have many common names: tiger worm, striped worm, dung worm, stick worm. Based upon these common names, they are the Rodney Dangerfields of the worm world because “they don’t get no respect.” But for gardeners, they are a great way to turn household organic waste into gardening gold. These reddish worms wiggle about when handled (hence their common name). They may emit a foul odor if handled roughly, and this fetid aroma gives them their species name: fetida. (Some literature gives their old species name as foetida, also meaning “foul smelling.”) But with a hands-off approach, these worms don’t stink the place up. Red wigglers are epigeic, meaning they are found in rich organic matter, often within the top 10 inches of topsoil. They do not burrow, but do shy away from the light. They survive well in containers, are hermaphrodites, and produce capsules or cocoons every two to three weeks. Young worms are appropriately named “threads,” since they are white and thin. They take about two months to reach breeding age. Adults may get up to about three inches long. Finding red wigglers is pretty easy. Internet searches will turn up companies that ship the worms, or you can try local sites like Craigslist or Nextdoor to find someone in your area selling worms. They are often sold by the hundreds or by poundage. If you know someone willing to give up a few dozen, you can get your starter going. What to put them in? There are various worm palaces or multi-tiered worm homes sold online or at garden stores. Some come with a bottom spigot to drain off moisture that settles to the bottom no matter what type of container you use. This liquid can be used as a “green tea” fertilizer. It is great for all kinds of plants, from vegetable gardens to houseplants. Worm castings or worm tea is mild and never burns flower or vegetable plants, so you can use it anywhere. A DIY project is to get two 18 to 20-pound plastic totes. One tote will partially nest within the other; the lower tub collects the moisture that drains through, and the upper tote contains the worms. Along the sides, bottom, and top lid of the second tote, drill small air holes with a 1/8” bit. These will help with air movement and drainage to the bottom. Many sites suggest starting out your new worm box by putting shredded, wet newspaper in the bottom to act as a bedding layer. Other sites suggest putting shredded coconut husk or peat moss in the bottom. Basically, you want to maintain a neutral pH in the bed, otherwise the worms will crawl up the sides of the tote. I’ve used moist straw with some shredded lettuce and a little compost from another bin as a starting bed. Moisten the material to the consistency of a damp sponge. Your containers can live inside, in the garage, on a back deck, or where you have space. Some people keep them in the kitchen, close to their food source. I have bins in several locations and even overwinter them outside in 55-gallon barrels insulated with hay bales. I continue to feed them through the winter and add extra insulation on top when the temperature drops to single digits. Providing for the moisture to drain is critical in this case. Otherwise, when it gets bitter cold the moisture inside the the containers freezes and kills the worms. When ready, shred your veggie material to help the worms consume it. If you pack a measuring cup or clean yogurt container with scraps, create a small mound in one corner of the container. Mentally divide the space into equal squares to help with adding the next cup a little distance from the first, and so on. The idea is that the worms will eat their way around the container. If they aren’t, you need more worms or less food or a second container. 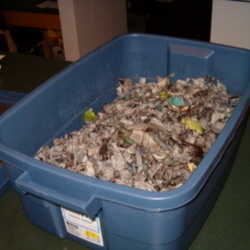 Also, keep in mind that bins with excessive scraps might attract flies or other unwanted house guests like mice. So, literally keep a lid on the project and enjoy being a worm wrangler!